Growing up memorial weekend was never a time to go to beach, or the lake, or hang out with friends. It was always a busy fair weekend. The week leading up to and the weekend of Memorial Day has always been Silver Dollar Fair in Chico. My sister and myself grew up showing sheep at this fair, and this year it was time for my little niece to show her first lamb at the fair. I guess that means, she isn't little anymore! 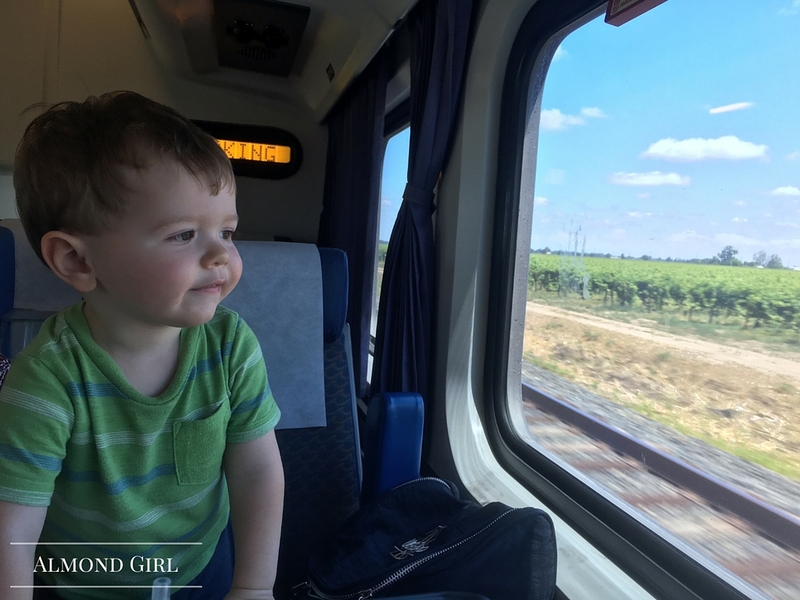 So I packed up my little almond farmer and we rode the train up north for a weekend of fair time, walnuts and family farming. My niece did a great job and placed 3rd in showmanship and market. She is a natural showman and has great potential of being an even better showman with more practice and hardwork. 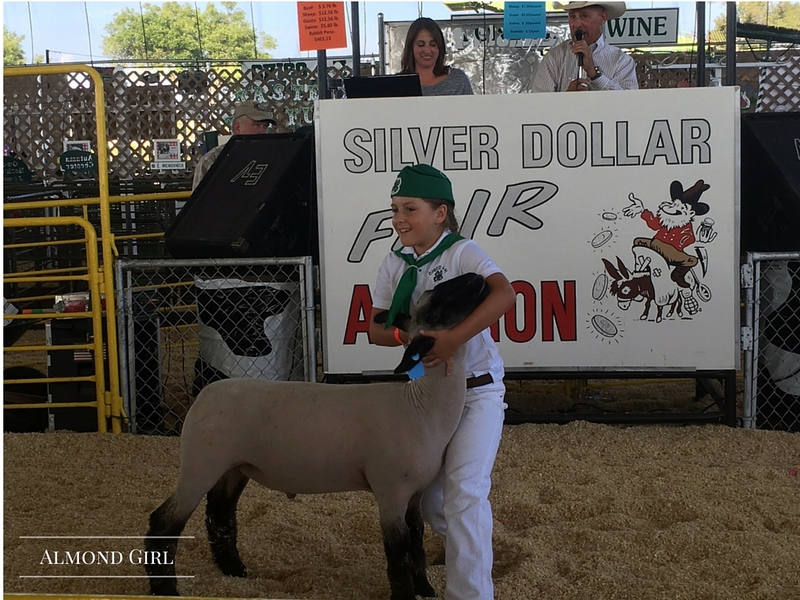 We spent a full day at the fair watching her show her lamb and then another even longer day at auction waiting for her to auction off her lamb. As I did my first year, there were a few tears but she still has a breeding ewe at home for her to still care for. With as much care and love she gave to her lambs as she was raising them over the past 4 months, it is no wonder she was a little upset to be saying goodbye. But in the end, she learned some great life lessons on responsibility, taking ownership, money management and caring for a living animal. She was already talking about how excited she was to pick out her next lamb this coming weekend for the next fair only 3 months away. In between days at the fair, my little almond farmer and I had to take the opportunity to share some time with my walnut farmer father. We went around the home place and checked on his walnuts together. My little almond farmer was fascinated by the sprinklers. 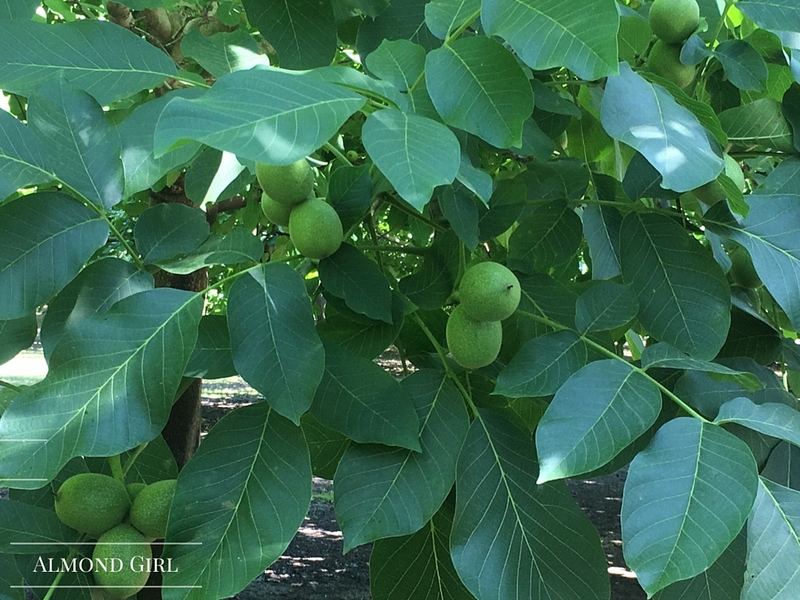 My dad's walnut orchards are irrigated on permanent solid set sprinklers. 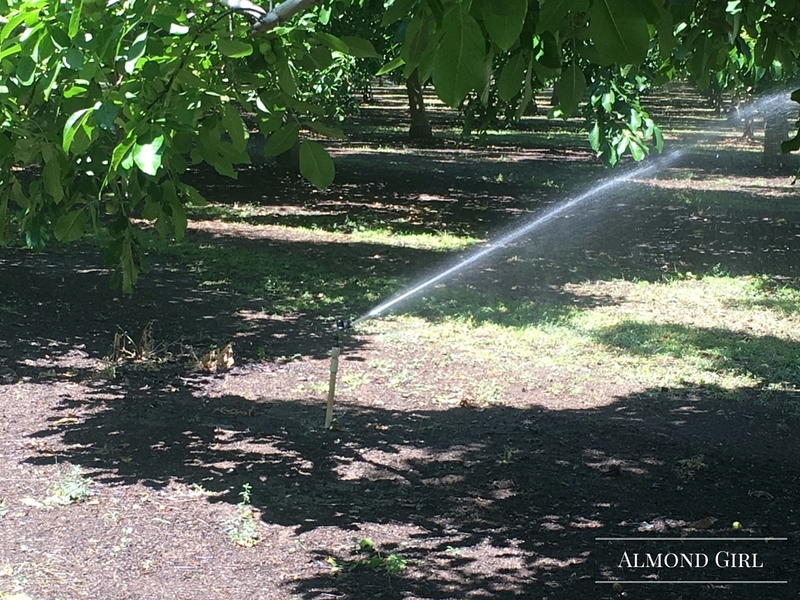 The pipes are buried under ground and the sprinkler stand and nozzles are above ground and rotate in circles to irrigate the trees. 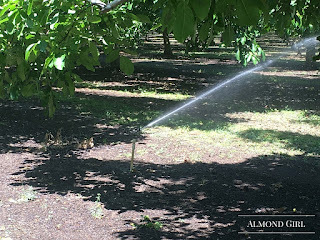 This is a common irrigation method for trees and one widely used in Northern California. The irrigation pump had just been turned on, so we had to check the sprinklers to ensure they were all working properly. Sprinklers can get clogged with debris and need to be cleaned out, or they can get stuck and need to be adjusted. This was a fun opportunity to show my son how my dad irrigates. It truly was a family affair that day. 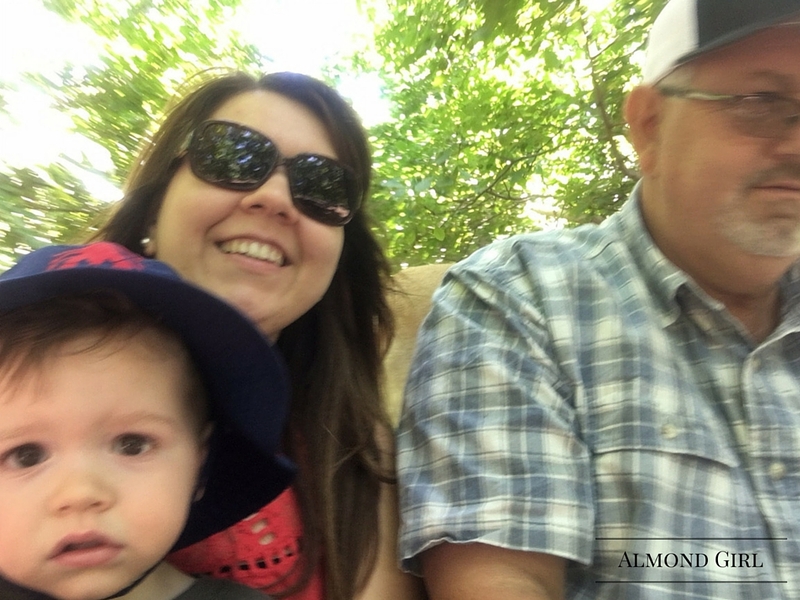 My dad, me and my little almond farmer out in the orchard together. That is what family farms are all about. According to the USDA, 97% of the 2.1 million farms in the US are family farms. I am happy to say I grew up on one of those and I am happy to still be a part of one today. Family farms are vital to our country and our children's future. It was growing up on the farm that taught me responsibility, hard work and love for agriculture. It was raising livestock and working on the farm that made me who I am today. Going home, even for just a weekend, reignites the true love for agriculture that I was raised on and am raising my son on.